On July 19, a 24-year-old black man named Adama Traoré died in the French town of Beaumont-sur-Oise, approximately 20 miles north of Paris. His family has claimed that Traoré was healthy, with no known respiratory conditions, and alleged that he was beaten to death. Police, however, say Traoré died after experiencing a heart attack while in their custody; he was reportedly detained for trying to prevent the arrest of his brother. So who was Adama Traoré? His death has incited #BlackLivesMatter protests in Paris and around France. An initial autopsy showed that Traoré died from an infection that spread to multiple organs and subsequently caused a cardiac arrest, but family members who were later given access to the body rejected this explanation, and decided to seek an outside expert's opinion. A second autopsy showed that Traoré had died from "asphyxia," but did not specify how. Family members claimed that Traoré had entered a police van alive when he was detained and was found dead at the station, a story that they did not think added up. The response to his death has largely been a grassroots effort. The French government has stayed fairly silent on the subject of Traoré's death. Instead, it has focused on the current state of emergency in light of recent terrorist attacks, and said it doesn't want to "cast 'suspicion'" on police officers. But activists and young people in Paris and neighboring towns are fighting for justice and accountability in Traoré's name. Protesters have set cars on fire, and eight were arrested after trying to set public buildings ablaze near Beaumont-sur-Oise, in the Val-d'Oise area. Traoré's family staged a sit-in at the police station where he was found dead, but their protest was interrupted by tear gas. 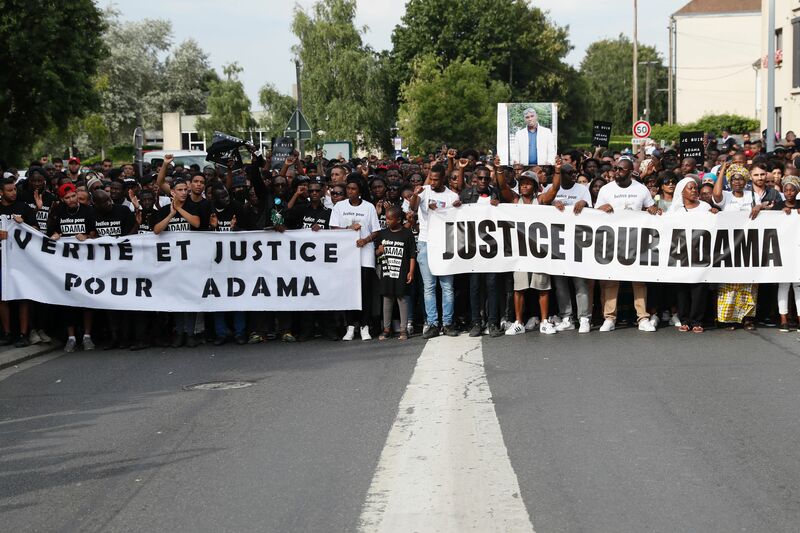 A silent march was later held in Traoré's honor, and #JusticePourAdama and #BLMFrance have been trending on social media in the hopes that his death will not be ignored. This isn't the first time such protests have taken place in France. After a police officer was not indicted in the death of Michael Brown in Ferguson, Missouri, activists around the world — including in Paris — marched and protested for #BlackLivesMatter. Back in 2005, two teenagers — 15-year-old Bouna Traoré and 17-year-old Zyed Benna — were electrocuted in a suburb of Paris as police chased them home after a football match. The officers were accused of doing nothing to help the teenagers as they neared a power facility, but they were cleared of these charges last year by a court in Rennes. The judge ruled the officers did not have a "clear awareness of an imminent and serious danger." Riots began shortly after their deaths, and led to a national state of emergency. BBC News reported at that time that events in France were a consequence of youth unemployment in the banlieues — suburbs — as well as an alienation of Muslim and North African immigrant populations in France. This is a problem that continues to this day, and according to many activists, Traoré's death in police custody reflects that. As a result, these activists want to remind the world that Black Lives Matter in France, too.